The Miranda has vertical contouring that creates a slimming silhouette, while precision tailoring hugs your waist at its narrowest point. Love this lab coat! It's made of quality material and the cut is very flattering. It's cinched at the waist to give a nice feminine figure. An original, delicately skirted back. 1 chest welt pocket and 2 built-in side pockets that can fit modern tablets. Vertical lines complement all shapes and sizes. Every time I wear this coat, someone has asked me about it. It's a beautiful white coat. It's sleek, well-fitted, and crisp white. A true slim fit - consider trying 2 sizes for ideal fit before sending back for embroidery. 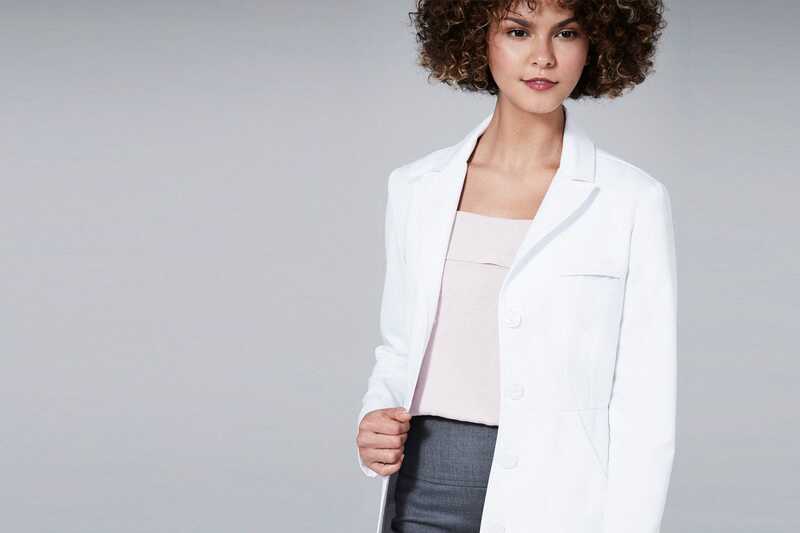 If you own our initial Miranda B. lab coat, you may have noticed the waist area has some extra room. We have improved the overall fit in the waist in this updated version, to ensure a more flattering, slimming shape overall while still appearing highly professional. Please order the same size that you ordered previously, unless you felt the original Miranda B. was tight in the waist when buttoned. In that case, order a size up. Click on the "Size Guide" tab above to see detailed measurements. The material in this jacket is top notch. It’s the nicest jacket I’ve owned in 20 years. The try-on process was effortless as I ordered a 12 and a 14 to see which fit the best before I had embroidery done. The embroidery is also nicely done. I love my new white coat! The quality and fit of this coat is amazing!! After shopping at some of my local stores and trying on frumpy, ill fitting lab coats, I was so excited to find this site. As a Cosmetic nurse I love making others feel beautiful and why shouldn't I be able to feel that too. Thanks Medelita! I ordered my coat, and while there was a minor problem with the embroidery, it was quickly resolved. Ultimately, I love the quality of the fabric and embroidery, as well as the quality customer service that I received. Love my medelita scrubs and lab coats, they are crisp, easy to clean and yield compliments whenever I wear them. They are a compliment to fashionable or traditional professional dress as well as scrubs. Great white coat! Excellent material! I would recommend to anyone looking to purchase a durable and fashionable white coat! Best lab coat I've owned. Superior quality and definitely worth the money. Well tailored, heavy cotton. Fits well. I’m 5’0 and 110 pounds. 00P was too tight around arms, 0P fit perfectly. Love the ability to try on and return. Q: Are these coats chemical/fire resistant? Thank you for your interest in Medelita apparel. Unfortunately our lab coats are not chemical and fire resistant, but they are fluid and stain repellent. Q: I've read some revues saying that the coat runs a size large ... I'm confused what size to order now. I wear Callia M3 size 4 thats perfect except a little snug at the hips. Any suggestions? Thank you for reaching out to us with your inquiry and for your interest in Medelita lab coats. Our Callia is considered a slim fit lab coat and is considered to fit more like an A shape. Considering that you have a curvy body type I would definitely suggest the Miranda lab coat. The Miranda lab coat has an Empire Waist which is very flattering on us pear shaped curvier body type's. You will be able to move more in the Miranda then the Callia. For starters, if you are located in the US, we do provide complimentary shipping and I would suggest purchasing both sizes for try on without embroidery. We encourage that you take advantage of our free shipping on all orders/exchanges over $100.00 and try both sizes before finalizing your order. If you are not located in the United Sates, below is our link to a very helpful and detailed size guide that can help you determine your best size and fit for the Miranda Lab coat. If you have any questions, do not hesitate to reach out to our Customer Experience team at 877.8987.7979, Monday - Friday from 6:30 am - 5:00 pm, PST. Q: Will the pockets of the Miranda B be able to fit an iPad (not mini size)? The size guide for it doesn't specifically mention this, unlike for the other lab coats. A: Great question, and I apologize for the delay! We left this off of the Miranda size guide because we have been receiving less and less demand for iPad measurements, and this particular coat features pockets where there might be an unusual amount of tension at the entrance of the pocket when attempting to fit a large iPad. If you have a "mini" version, this will fit all sizes just fine. I hope this helps! Q: How does the Miranda slim coat compare to the Callia slim coat? The m3 Miranda Slim Fit and Callia Slim fit will fit similar in the waist, shoulders and bust. The hips will be slimmer on the m3 Callia based on the style and pattern. The m3 Miranda has an empire waist and is lose fitting around the hips. The m3 Callia has a beautiful 2-button back belt detail. If you would like additional information in regards to the fit please feel free to contact the Customer Service team at contact.us@medelita.com. Q: Hi! I love this white coat and want to order it, question about sizing! Can I get the sleeves 1 inch longer and the coat length 1 inch longer, in a size 6? I own the Vera G coat, is the sizing for the Miranda B the same? Is there a discount for residents? Thank you for being a Medelita fan! We definitely do offer alterations, their are fees per alteration request, but it is always an option for both sleeve lengthening and coat lengthening. All of our coats are designed with an additional 1 inch of fabric on both the sleeve and the end of the coat. Sizing for both the M3 Vera and M3 Miranda coats are very close but off by 1/2 inch in the bust and coat length, and a 1/4 inch in the sleeve length. The low hip measurements are the same. You can take a closer look in the following links. Yes, we also do have a resident program that provides residents with an individual resident discount code. Please contact contact.us@medelita.com for assistance in getting this started. I hope I was able to answer all your questions. We look forward to completing your next order.